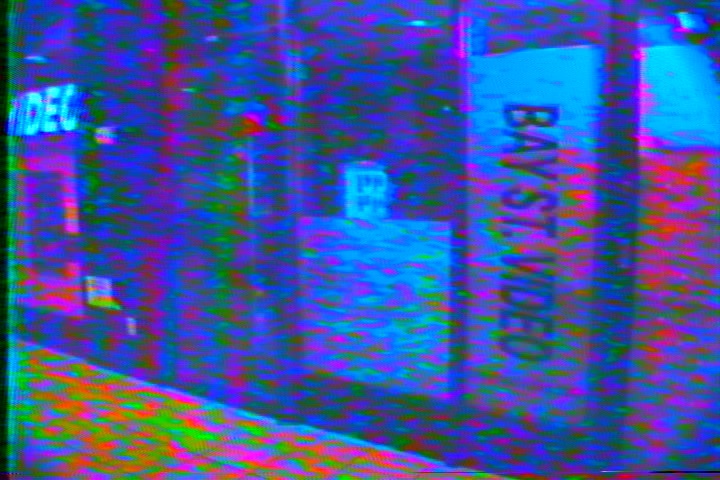 Frame grab from the Teaser Trailer for BSV 1172: Your Friendly Neighbourhood Video Store, which had its World Premiere Sunday November 13th, 2016, at the San Diego Underground Film Festival (SDUFF). For those who caught BSV 1172 at SDUFF today and are a little curious about some of the vintage analogue gear used for the film, I’ve assembled some production stills and a few frame grabs that provide a short narrative. The gear listed in the film’s End Credits are wholly representative of the various 30+ year old cameras and video processors used to film each sequence, and in the new year (which is what, about a month and a half away?) 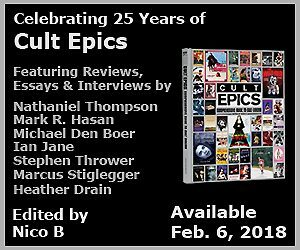 I’ll assemble shorts showing off each camera that’ll be part of the Special Features which will accompany the purchase of the film in 2017. Dropped from both edits is a Prologue that sounded great in theory but proved very unusable, and among some of the production shots that follow are stills from that night. At least three 12am-7am ‘days’ were used to carefully set up the mass of shots that were largely junked, save for a handful retained for the night shots. The first set of stills showcase the main camera used in the shoot, a Canon VC-50 Pro that uses a Saticon tube which produces a soft pastel colour palette. The camera’s not great with high contrast lights – bright whites obliterate detail – but even mid-range ENG cameras like JVC’s BY-110U has trouble with hot whites. What follows are some of the colour processors, lenses, and other cameras used during the after hours shoot at Toronto’s Bay Street Video. 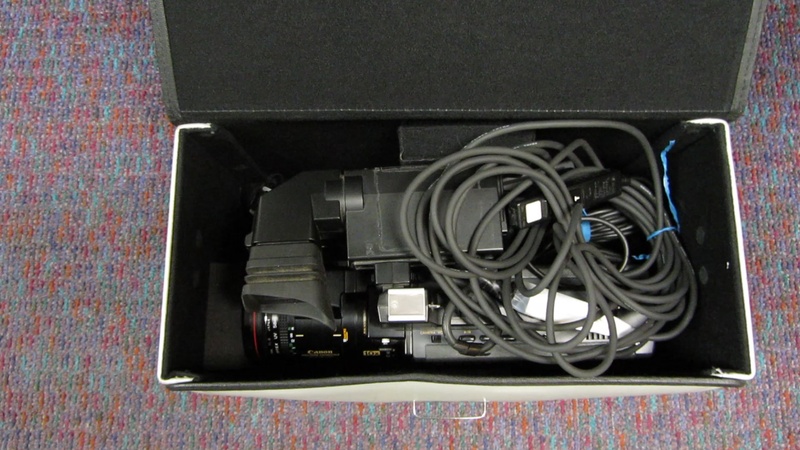 Canon VC-50 Pro, packed tightly in its original case with remote for the zoom and Start / Stop; and wide angle lens adapter. 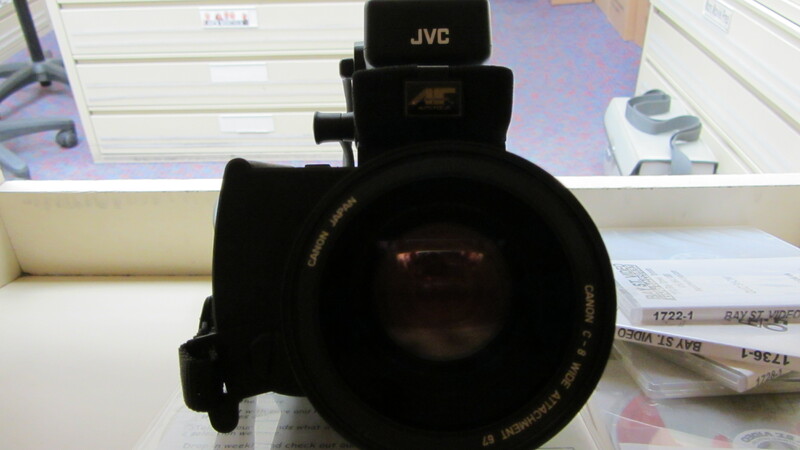 Canon VC-50 Pro with wide angle adapter ready for a pan shot for a furnace montage slightly shortened in the Film Festival edit. 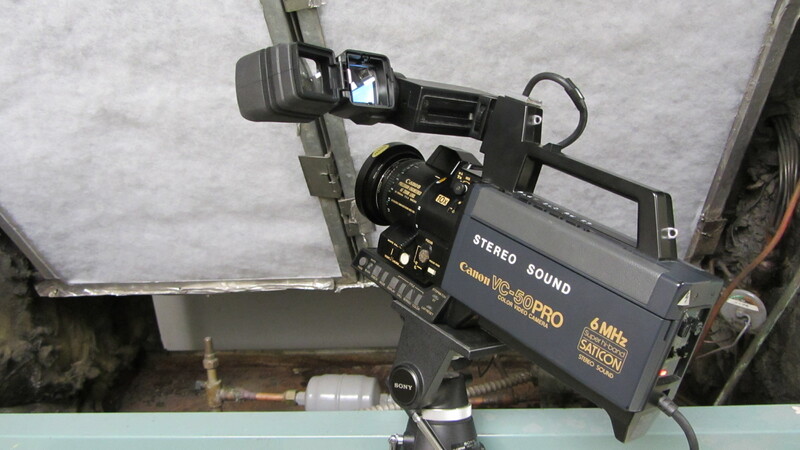 The Canon VC-50 Pro poised to capture the magic of industrial clamor, and record it to miniDV using the Sony GV-D1000. 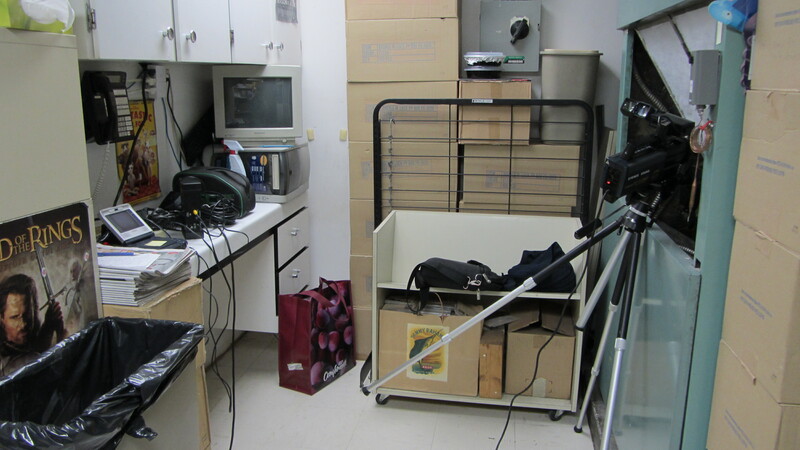 The tripod is from a Sony AVC-3250 package, about 40 years old. Works perfectly. Canon VC-50 Pro with its wide angle adapter set up for a montage that was dropped from the Festival Edit. 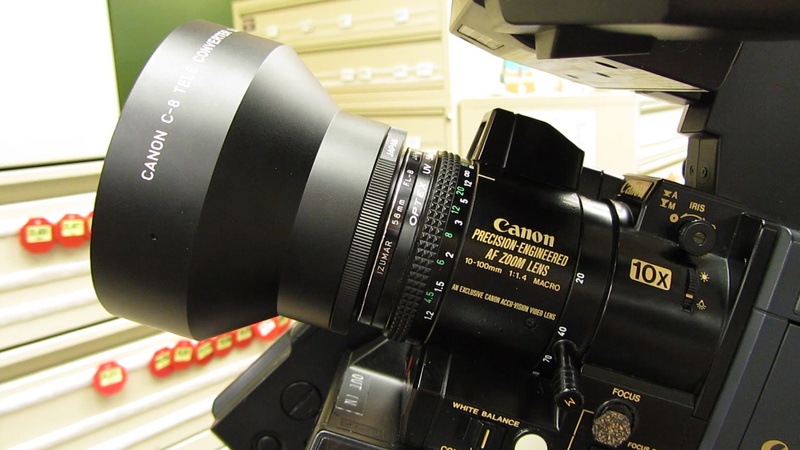 Mark Hanson (Associate Producer, Additional Cinematography, and Star) balances options for optimum visual aesthetics and the Canon VC-50 Pro (outfitted with a macro adapter) on a nice green lazy-Susan originally designed for restaurant use. Small LCD monitor to compensate for camera’s built-in monochrome viewfinder? Check. Canon wide and tele adapters? Check. RCA tele adapter? Check. Lens blower? Check. Oatmeal for late night dinner? Check (in the back room). 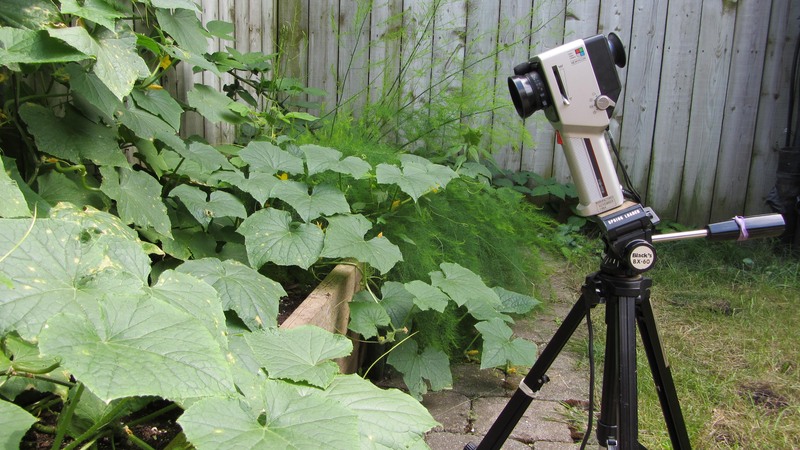 Outfitting the Canon VC-50 Pro with an RCA telephoto adapter. Whether it’s a Canon, RCA, or Sony-branded tele adapter, they all fit because of the standard 58mm lens thread, and the fact all fixed lenses on these consumer cameras were often made by Canon. The Canon VC-50 Pro with the ludicrously massive Canon tele-adpater which, like the Canon wide-adapter, was actually made for its Super 8 film cameras. The film camera lenses used a larger thread, but the original Canon lens packages came with step-down rings. The manual for the VC-50 even states these two lenses are meant for this camera model, too. Filming a shot with the Canon VC-50 Pro and its tele adapter that (surprise) was dropped from the final edit. 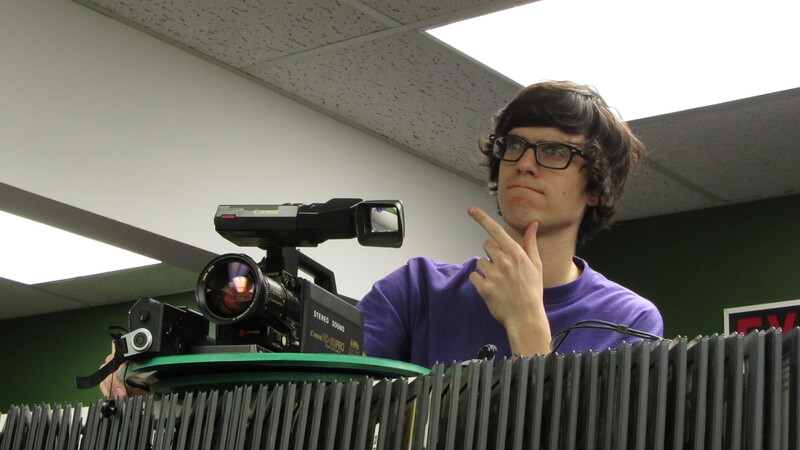 What’s important is A-level effort on the part of the director, right? 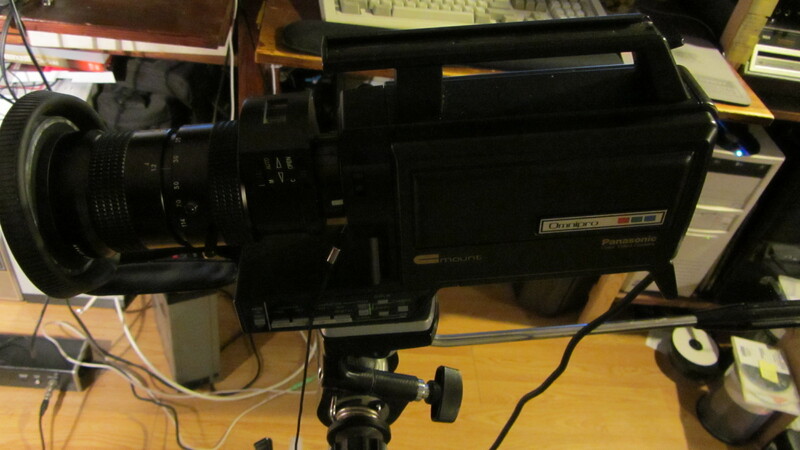 Filming a moment in the post-credit nighttime montage with the Canon VC-50 Pro and the RCA tele adapter. 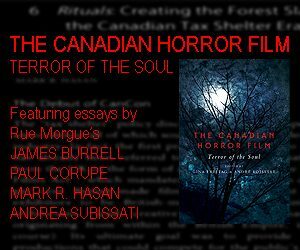 Filmed in 2012. Those 1980s Okidata printers are still there and in use, including half of the PC terminals in the shot. Before you laugh, how long did your printer last? And when did your Mac die? Pro-level monitors cost hundreds, so I opted for a small monitor used to check security cameras. 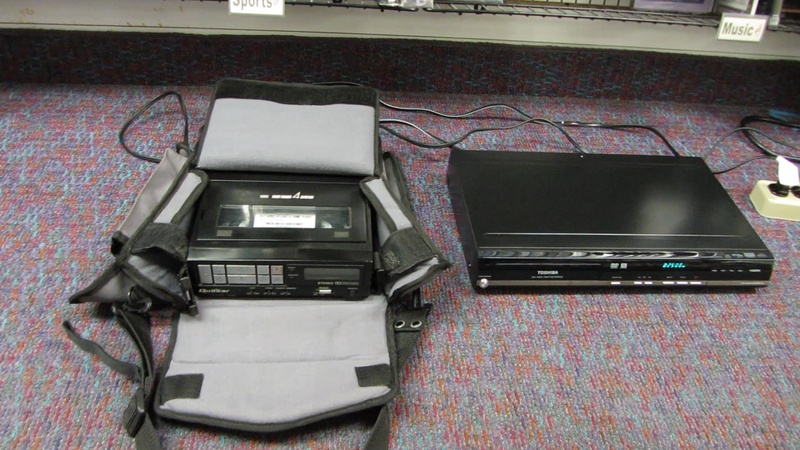 The gizmo to the left is a colour corrector made by Showtime Video Ventures that plugs between the camera and VCR, and allows one to fix bad colour, boost video levels, and over-blast colour levels. 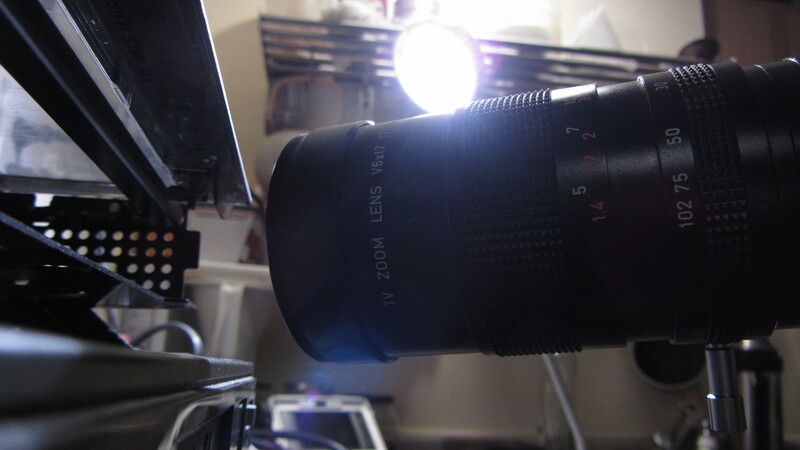 This unit proved gold during filming, although you need a jewel screwdriver to make adjustments, like the old 3-tube ENG cameras that lacked auto-registration. 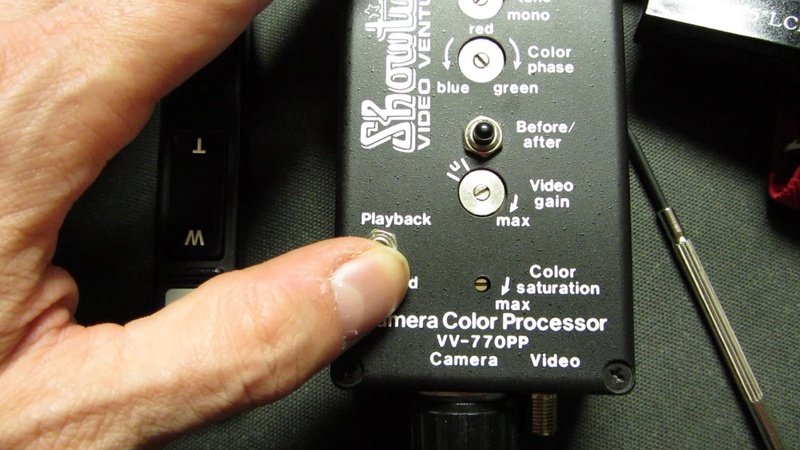 Closer view of the details of the Showtime Video Ventures Camera Color Processor VV-770PP. They also made a separate enhancer that boosted detail. Both of these gizmos also existed as boxy standalone units that were extensively used in post-production for the film’s visual effects. An example of what the raw footage looks like when blasted at max colour saturation using the Video Ventures camera and standalone gizmos. 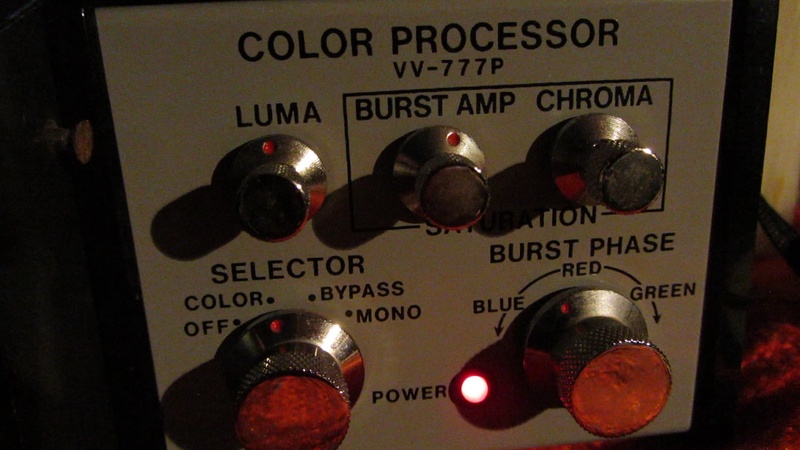 Here’s the standalone Showtime Video Ventures Color Processor VV-777P which has most of the features found on the camera unit. 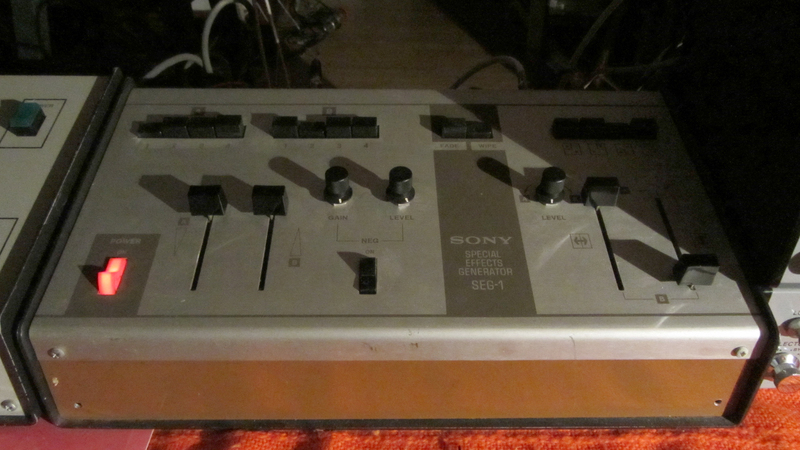 A 1968 Sony SEG-1 special effects generator / mixer. This unit is severely wonky, but proved invaluable when threaded beyween a mass of Showtime gizmos that allowed for unstable sync, colour and video levels to create background templates for the film’s ‘360’ finale montage. 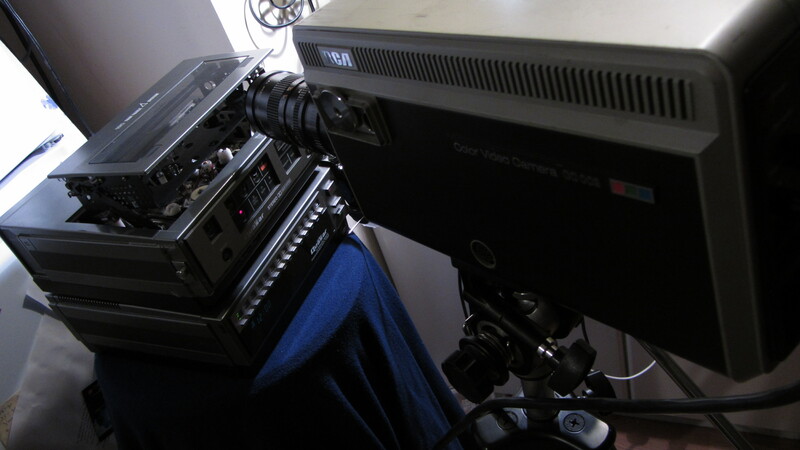 Master footage was played from a Toshiba DVD recorder, sent through several Showtime gizmos and the Sony SEG-1, then routed to a Sony GV-D1000 recorder that sent the footage straight into Adobe Premiere for layering and treatment. I never use that Rubick’s Cube (below monitor), but the metal Slinky upon which it rests occasionally provides amusement. 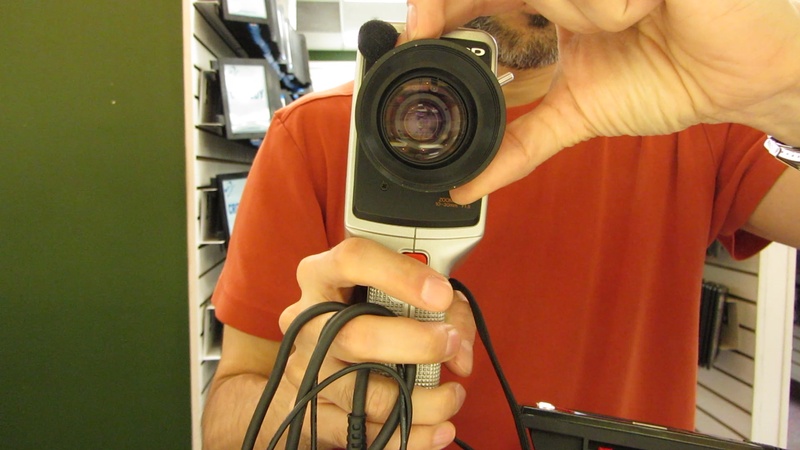 The Sharp QC-54, at the time the smallest consumer tube camera. The Newvicon tube is in the handle. Audio is mono, and the lens is severely limited, although Sharp produced a wide angle adapter for the non-standard thread. 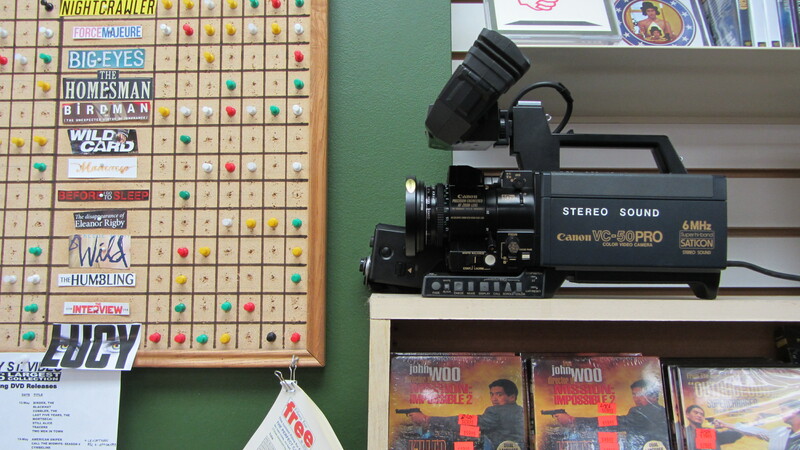 This camera was used for the customer POV’s in the central ‘buying and renting’ montage in BSV 1172. The director (me) explains to Caroline the magic of the Sharp QC-54 in this pre-production camera test of the store’s pre-existing lighting, and the camera’s inherent green hues that need to be graded out in post-production. 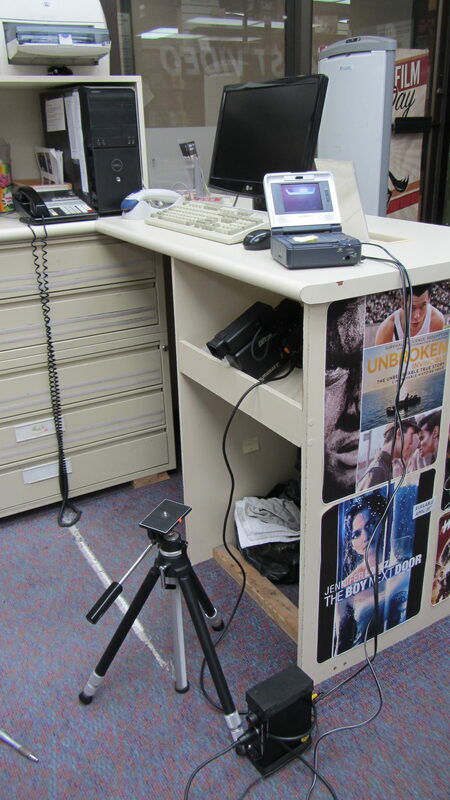 The JVC GZ-S5 Saticon camera used for a few quick inserts when DVDs tumble through the drop slot. 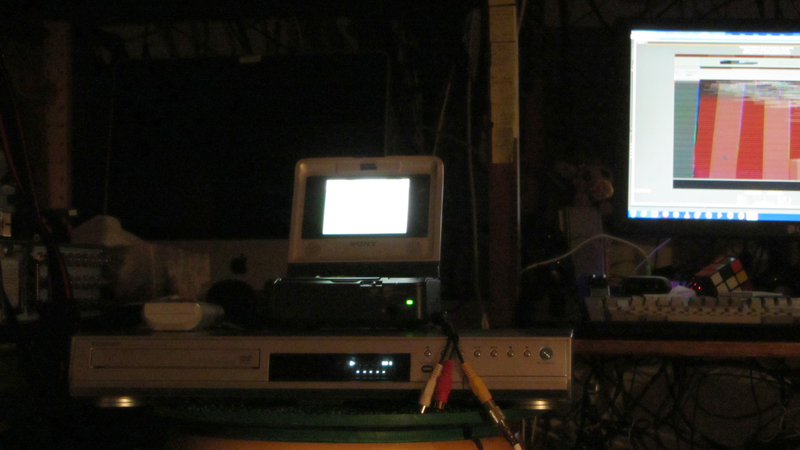 Footage was recorded on miniDV using a Sony GV-D1000. 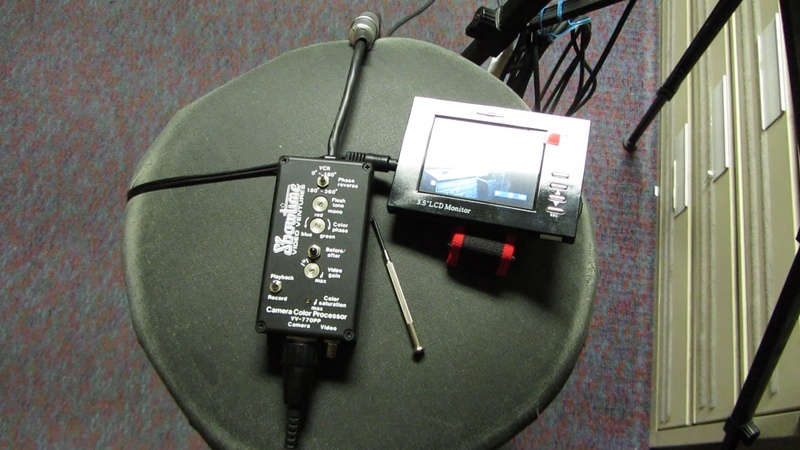 The JVC GZ-S5 outfitted with the same Canon wide adapter (plus a step-down ring), ready to record the tumbling DVDs. 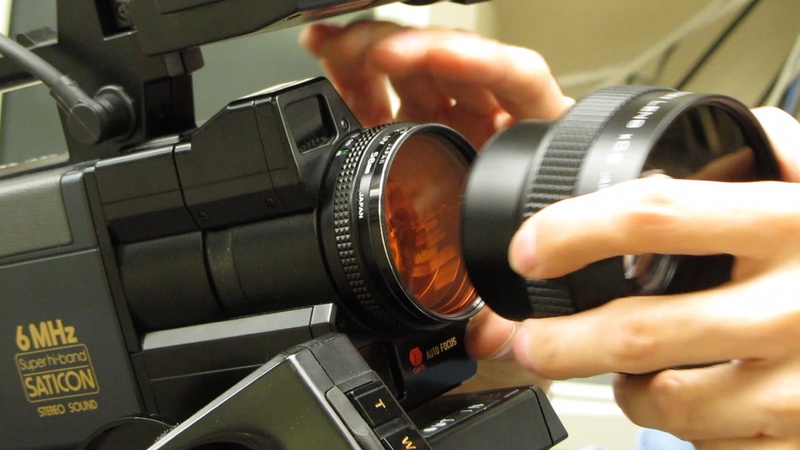 A Panasonic PK-972 Newvicon camera used for BSV 1172’s Main Title sequence. Unlike other models, this unit accepts C-mount lenses. 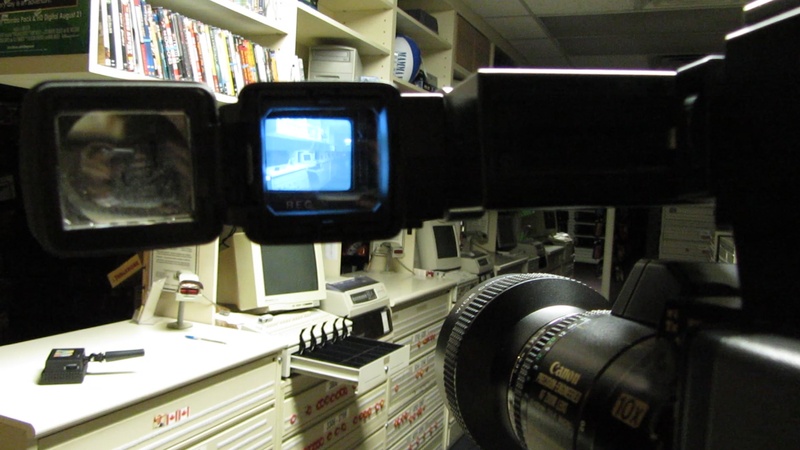 A Panasonic PK-200 Vidicon tube camera, used for the opening credits as the camera tracks around a Quasar VCR. 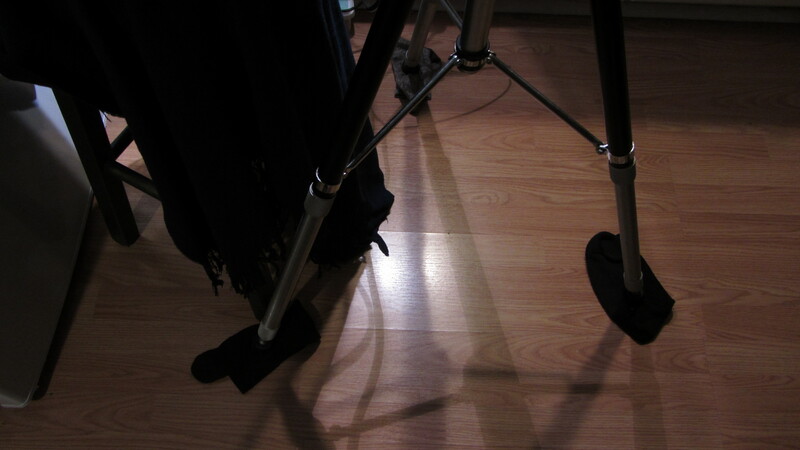 … Which is magically achieved when socks are placed under the tripod feet to enable a smooth glide on a faux wooden floor. Worked like a charm. 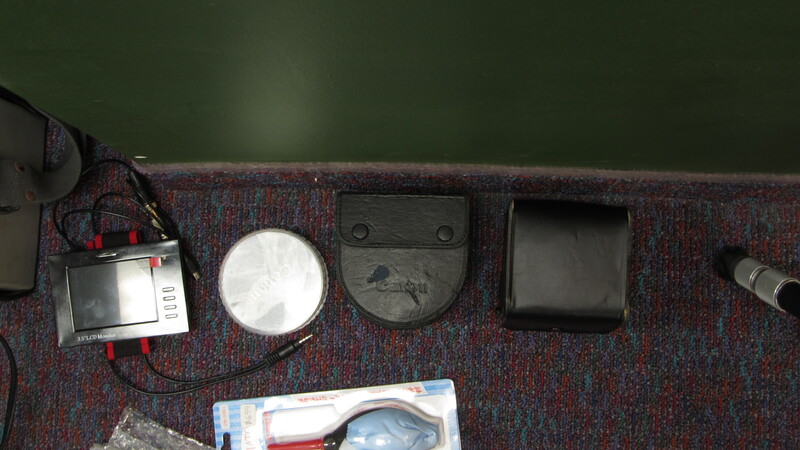 The slide transfer kit from where that macro lens came. 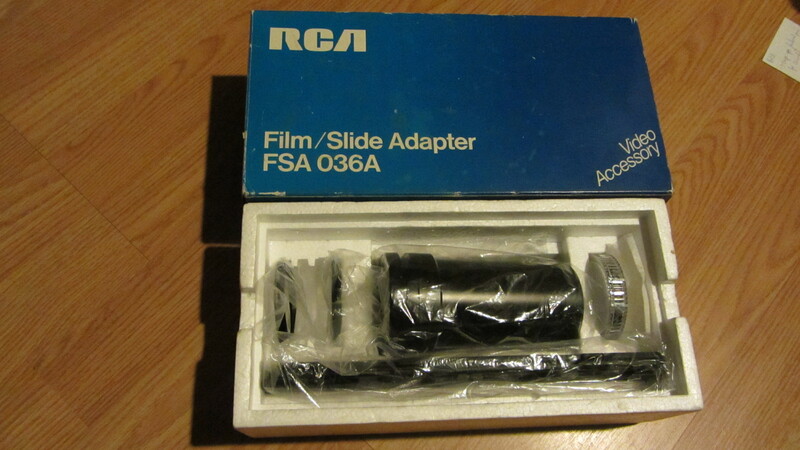 These kits were made by (or really for) RCA (model RCA FSA-036A), Canon, and others, and came with special filters plus step-rings. 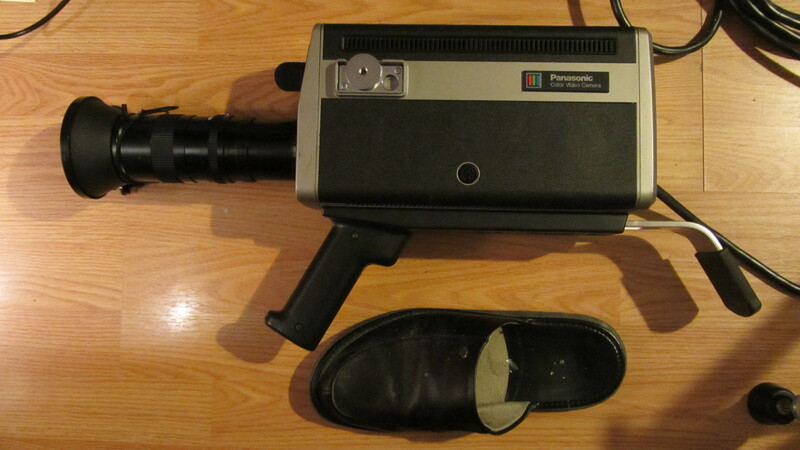 A Panasonic PK-200, placed beside a size 7 men’s slipper for scale. For a consumer / prosumer camera available between 1978-1982-ish, its size and bulk is ridiculous, but the Vidicon image is quite robust. The camera test of the Sharp QC-54 is available on YouTube and Vimeo (see end of this post for links). 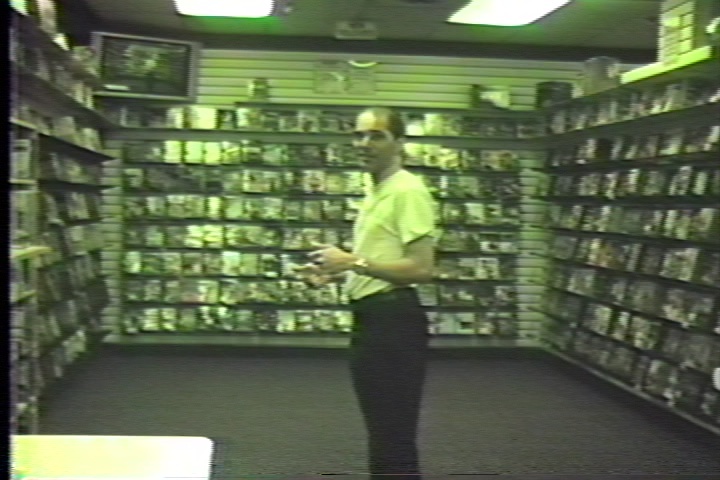 Those curious about my reasons for making BSV 1172 should check out my podcast at KQEK.com which ostensibly showcases the first half of a conversation with I Lost It at the Video Store author Tom Roston and NOW magazine’s Norman Wilner that took place at Bay Street Video in early May during Hot Docs.